I don't have much to say about this incident. On Detroit's east side one man armed with a gun tried to rob another man. The would be victim was legally armed and defended himself, shooting the robber multiple times. The robber is still alive. The victim had no time to call the police. And since the victim is neither bulletproof nor a superhero he had no way to wrestle with the assailant and disarm him without being shot. The victim did run away but again only Superman is faster than a speeding bullet. We stop someone who is wrongfully initiating force against us by meeting that force with equal or greater force. I think that there are many reasons why violent street exists, some of which the government can and should address and resolve and some of which are probably beyond government solution. But that's another discussion. When someone is either shooting at or threatening to shoot you, it's too doggone late to make his parents raise him right. It's too late to give him enough self-respect and material success so that he won't want to risk prison or death. It's too late to rewire his moral code so that he doesn't enjoy hurting other people. The only thing we can do is stop the threat. And the most effective way of doing that is to be armed. There are some areas that are more dangerous than others. People who can should avoid those areas. But sometimes you can't avoid being in a bad area because it's your home area. Most people are not criminals. Most people won't ever be attacked. But I think it is non-negotiable to insist that American citizens retain the right to defend themselves both in their homes and in the streets. 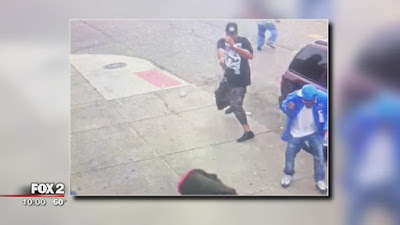 DETROIT (WJBK) - An attempted robbery in Detroit didn't go as planned for the suspect, when the intended victim pulled out a gun and started shooting in defense. A Concealed Pistol License holder acted quickly, pulled his gun and shot the armed suspect to end the threat. Cynthia Quinn rushed to Henry Ford Hospital when she heard her son Sanchez Quinn had been shot. She called FOX 2 upset because she didn't know why she was not allowed to see her wounded son "When I went to my son's room I was stopped by two police officers (who) told me to get out of my son's room," she says. "'Why you here? You can't be here.'" It turns out, although he was shot multiple times, the 29-year-old was not the victim. Detroit police say Sunday night he tried to rob two men outside the Super X Market, a Green Light location at Charles and Sparling on the city's east side. All of it was caught on high-definition surveillance video. Also, little did the gunman know, one of the guys they tried to rob was a CPL holder. FOX 2 spoke to him by phone. "I turned and looked and saw the other gentleman had a gun pointed at my face," the man said. "I was able to knock his hand down and the gunfire rang out."